We want to help individuals on the autistic spectrum who may have trouble communicating their emotions. Our project, coined EmotiComm, endeavors to empower individuals on the autism spectrum with the ability to communicate and feel comfortable in social environments. We utilized both environmental sensors and user input to create the optimum experience for those who may have trouble expressing themselves. First,a button allows the user to activate an RGB LED that indicates whether or not they feel uncomfortable in their environment using universal color indicators: green, yellow, and red. This is important as individuals with spectrum disorders may have trouble expressing themselves when they are overwhelmed. This gives them an intuitive, accessible gesture to quickly communicate their feelings. As well, we have included an ultrasonic sensor, that utilizes echolocation that determines if an individual is approaching the user’s personal space in an undesired way. A small then buzzer alerts the user of the individuals approach to prevent them from being surprised by the person’s close proximity, which can be a source of discomfort for those with spectrum disorders. We ensured we acknowledged the diverse nature of spectrum disorders. The EmotiComm project is powered by Arduino, and thus completely modular. If one does not want a sensor, they can disconnect it. We hope to make life more accessible. 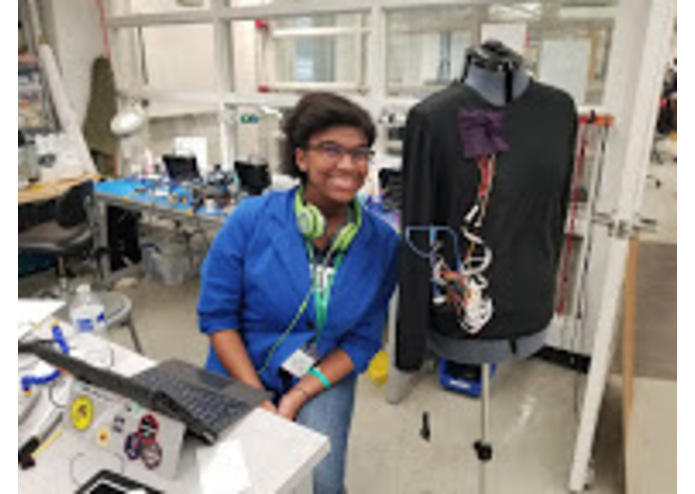 We attached an ultrasonic sensor, RGB LED, Piezo electric buzzer, and an arduino to a long sleeve shirt. Some wires were very thin and difficult to solder. We are raising awareness about the importance of accessibility. We learned more about the abilities of arduino, such as echo location through Ultrasonic sensors. We want to make more modular components which can be added at the user's discretion. Was in charge of circuit soldering the equipment, helped lightly with the code. I was in charge of installing the equipment, and debugged the circuit.